“U.S. Retail Sales Soared in May” and similar headlines graced the media this morning – and not a word about inflation, or rather the loss of the dollar’s purchasing power in May that caused nearly half of the gains in retail sales. Total retail sales, including food services such as restaurants, surged 5.9% in May from a year ago to $501 billion (seasonally adjusted), the Commerce Department reported this morning. Retail sales without food services jumped 6.0% to $443 billion. Excluding motor vehicles and parts, retail sales jumped 6.4% to $399 billion. Those are big jumps! So this looks pretty good. The year-over-year percentage increase of total retail sales, at 5.9%, is at the top of the range over the past few years but below the annual increases from 2010 through 2012 which had easy year-over-year comparisons due to the buyers’ strike that had occurred during the Great Recession. The sales increases were strong across the board except electronics and appliances, where sales rose only 1.9% year-over-year, and in the category, sporting goods, hobby, musical instruments, and book stores, where sales fell 0.7%. “The report suggests low unemployment, rising wages, and tax cuts are prodding Americans to spend,” the Wall Street Journal gushed. “That, in turn, is boosting merchants’ sales while stoking stronger growth in the world’s largest economy.” Similar things cropped up across the media. But on Tuesday, inflation as measured by the Consumer Price Index shed some light on what would happen in retail sales today. CPI rose 2.8% in May, the fastest year-over-year jump since February 2012. Conversely, the purchasing power of the dollar dropped 2.93% in May from a year ago, the fastest drop since November 2011. The loss of purchasing power of the dollar is unevenly distributed over various products. Beyond retail sales, the purchasing power of the dollar has essentially collapsed when it comes to buying a home in some of the hot housing markets in the US. For retail products, the decline in purchasing power of the dollar also varies. For example in May, it took 21.8% more dollars to buy the same amount of gasoline as a year ago. But retail sales of gasoline rose only 17.7% over the same period. In other categories, the price increases were much smaller. 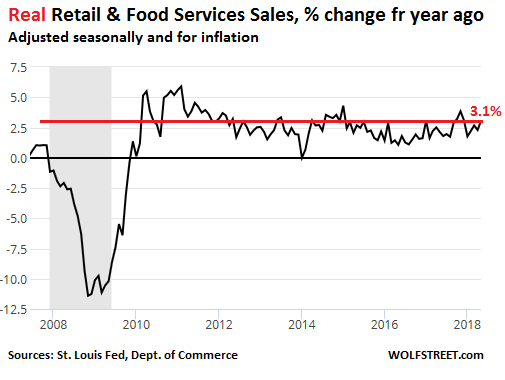 The difference between the retail sales increase of 5.9% (not adjusted for inflation) and the “real” retail sales increase of 3.1% (adjusted for inflation) is the loss of the purchasing power of the dollar — which accounts for nearly half of the increase in retail sales. It just takes a lot more dollars to buy the same thing. Retailers and consumer products companies love consumer price inflation. The more the better. It boosts their revenues without having to sell an extra thing. And that makes the top line of their earnings reports beat expectations. But they’re not so enthusiastic about the rising input costs, including rising wholesale prices and surging transportation costs. So they’ll have to do some financial engineering to overcome the hit to earnings-per-share from those cost increases, and share buybacks are perfect for that, while still allowing them to bask in the glory of revenue surprises to the upside induced by the loss of purchasing power of the dollar. So everyone is happy — except consumers whose wage increases just got wiped out by the eroding purchasing power of the dollar. The average household is not seeing their incomes rise to keep up with inflation. Safety nets for the vulnerable are eroding as rising interest rates will consume more of the government’s budget. A little inflation is fine but hidden inflation has been outpacing average household incomes for awhile now. Not even the state minimum wages of $15 an hour will help when workers’ hours are cut and some jobs are lost to preserve the bottom line. How restaurants can be put in the same category as hardware stores confuses me, until I remember English is a language of pirates. In most other languages, restaurants, pizza places and so on are in a totally different category. As pointed out, the Commerce Department reports retail sales without food services as well. So you can look at both, with and without. Oh, come on, what inflation? In 2000, you could get a decent one bedroom apartment in San Francisco Bay area for around $650/month; now the same apartment costs $1800 (And if we go by zestimate $2500). 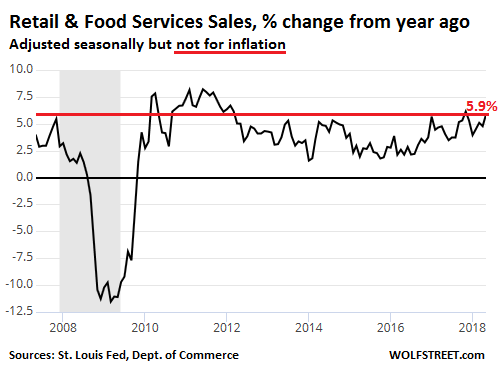 So, where is the inflation? Inflation is all in your mind; only government numbers give you the truth :). The #1 in front of the number is smaller than the #6 so obviously it was more expensive in the past then it is today. Don’t worry about how many 0’s follow the number, those are for someone else to worry about. Sorry to break it to you, you can not find a “decent, 1 bedroom apartment” in San Francisco for $1,800/month. I doubt that you could find a studio with 0 bedrooms for $1,800/month. As one living in Boston, that one had me scratching my head also. My son just signed a lease on a drafty 2 br in a 100 year old 2 family about 5 miles out for $2100 a month. In-city artisanal grass-fed organic macrobiotic studios and 1 brs start at that. Tariffs are far from an issue on these stats. The chart shows that since 2012 the numbers have been fairly flat, fluctuating up and down without any major catastrophe other than the oil drop. Tariffs may show a noticeable difference come fall as the 2019 vehicles start to make it to market since they are being produced with cheaper products until the next order of products is required some time this summer. Is the dollar really losing purchasing power? If you look just at base commodities you get a little bit different picture. WTI is still down close to 40% from 2014, natural gas is flat over the last few years, copper is strong recently but still lower than it was 10 years ago, silver is stuck below $20, wheat, corn and coffee are in the doldrums, iron ore is down over 50% from its highs in 2011. So much of what is included in the CPI basket have prices based on politics (rent, medical services, college education) or purely discretionary luxury purchases subject to trends (jewelry, pets, restaurants). Commodities with broad, global markets paint a different picture of the value of a dollar than prices based on politics or fashion trends. Commodities are only a small part of the US economy, in terms of dollars. Consumers don’t buy WTI. Companies, outside of refineries, don’t buy WTI either. Commodities are not the definitive measure of purchasing power. But since commodity prices filter into retail prices, they’re already reflected in the purchasing power of the dollar. Yes, but commodities (ag, metals, fuels, etc.) are at the base of economic activity. Everyone (unless you are the Unabomber) uses oil, copper and ag commodities indirectly. You cannot do hedonic adjustments to commodities. In the U.S. a combination of monopoly control, politics and debt leveraging cause high prices for medical services, education, automobiles, cell phones and rent. CPI is a political tool; items are added and removed from the CPI from year to year. I don’t know if you can go so far as to say it’s manipulated, but it is certainly providing a convenient back story to justify raising interest rates and draining liquidity from the banking system. CPI may be a decent measure of prices that consumers pay, but is it a good measure of the value of a dollar? Yes, in terms of retail purchases. I think what you’re getting at, and as I mentioned in the article, the purchasing power of the dollar varies by product. You mentioned commodities. Here’s another product: housing. The dollar’s purchasing power has essentially collapsed over the past few years when it comes to buying a home in one of the hot markets in the US. This is why we talk about different types of inflation: consumer price inflation, asset price inflation, producer price inflation, wage inflation, etc. Agreed on the different types of inflation and the collapse of the dollar w.r.t. to housing. There are several important differences between an asset like housing and commodities. In theory, the price of all housing in a given neighborhood (or a given company’s stocks) can be set by a single sale. With commodities, many transactions take place worldwide every day. There are something like 200,000 gas stations in the U.S. alone with hundreds of thousands or millions of tanks filled every hour of the day. Prices of housing are driven for the most part by debt leveraging, not material or labor input costs. So what determines the value of a dollar? With rising interest rates and less liquidity, I expect the dollar will regain a lot of its purchasing power w.r.t. housing. I also like other inflation measures just because they don’t have so many adjustments. There isn’t a perfect price index. The commodity and PPI makeup change over time as does the economy, so it’s difficult for any single measure to capture what is really happening. That’s why there will always be discussion of the topic. I like the PPI or wholesale prices, or whatever they call it these days. If you get wholesale prices inflating or deflating seriously, you know something is happening. And, since the REAL rate of inflation is north of 5% as per John Williams’ Shadowstats then retail sales are flat at best. The only things I splurge on a bit are bakery items and makeup. Both have had eye popping increases. The box of 4 small apple strudels is now a box of 3, same price, which amounts to a 25% increase. My favorite mascara which last year was a ridiculous $20 is now an eye popping $33, a more than 50% increase. Even the little luxuries are becoming unattainable. But the Safeway deli sandwich that I have been buying for over a decade (“pastrami on Dutch crunch, avocado, olive tapenade, no cheese, no mayo, lettuce, tomato, cucumbers, lots of onions, thank you” … I got this down pat) went from $4.99 in 2007 to $5.99 a few years ago, and to $6.99 a few weeks ago. Talk about sticker shock! We all have examples of individual items that stay the same for some time and suddenly jump in price. But there are some big ticket items in our lives that have moved little or not at all. For us, luckily, this includes our health insurance, which barely budged over the past two years. jeeze Wolf, you could cut your inflation down considerably, perhaps by spending some additional doin on what you would’ve spent buying that Deathway sammich … and just purchasing the ingredients outright ! … then you’d have enough for,say, 8 or 10 of what They sell. Better tasting and healthier too ! Yes, look, the global headquarters of my WOLF STREET media mogul empire is in my office at home, and so yes, most of the time, I fix my own food, and when I’m really lucky there are leftovers from dinner. But sometimes I’m tired of eating at my desk in my global headquarters, and I’m tired of eating my own food, and I hafta get out…. Also sometimes I get back from a swim in the cold Bay and I’m just starved and don’t want to fix anything… I just want to get something I can bite into, and that Safeway is just a short detour away. There are no bots at this deli. But Cantonese language skills would be helpful — and fun! Wolf, you have got to pay for the person making that sandwich for you. You wouldn’t want their wages to stagnate, would you? Cause the ingredients for that sandwich probably doesn’t exceed $1. But don’t worry, once we can automate that process, the pricing will come right back down with volume. Oh, and Petunia, and you might appreciate this. We like good cotton sheets. The prior set we bought were on sale (maybe at Nordstrom Rack?). We paid around $260 for them (California king). Made in India. A few months ago, we needed a new set, and so being a modern human, I went online and bought a gorgeous, superbly made set, same size, beautiful cotton, for $68, via Amazon, directly from the manufacturer in India. The deal cut out nearly all the middlemen. That’s deflation. E-commerce has a lot of those stories too. A bit of an Off Topic question here.. I’m personally in the market for a really good set of “Flax” linen sheets myself. Can you make a recommendation based on your experience? I’ve bought these in the past from Bed Bath & Beyond but they weren’t quite the top notch quality I’d been hoping for. So any pointers you have, on your experience, I would really like to receive.. I used to go on the hunt on Amazon for men’s shoes that were deeply discounted … high quality but for some reason about 50% or much more below the normal Amazon discount price. They were a find, not a norm. They’re not there anymore. Discounted values are always there and always have been, but the real steals are few and far between now. Perhaps the economy and personal income are rising and spending is reflecting that? No need to routinely discount deeply anymore? Inflation is not the same as the end of deflation … likely caused by abnormally low interest rates for too long. Or maybe Amazon now getting to be so gigantic-colossal they are through “chumming” the waters for those recent good buys on your shoes???? No, reject that. Amazon isn’t a conspiracy any more than Best Buy is a conspiracy. Those deals are gone now. As a recap: Income comes from labor and income comes from capital. Nowhere else. QE and abnormally low rates replace capital with printed money and asset bubbles and income with asset inflation. Actual income from earned invested capital disappears and is replaced by the wealth effect. Actual savings is consumed to meet living expenses, causing capital destruction. QE only benefits the top of the top who can profit from flipping paper assets. The rest go on a slow decline. Deflation is a natural result from extended QE. Prices fall to available real income. Now that rates are rising, income is increasing as a result. Deflation is no longer needed. Falling incomes, such as those globalists would approve of due to open borders and low interest rates, are an now issue, not a certainty. Thus, are we experiencing inflation, or a return to normal prices where income is the weak link now? Are we experiencing a recovery from the damage caused by bad ideas that took hold a few years ago, or normal textbook economics and normalization in the overall economy? No problem, I have a lifetime supply of shoes, and many other things, maybe almost everything – one of the dubious benefits of reaching a certain age. I wonder what California’s cap and trade experiment has cost the state’s average consumer in recent years? A free tip for seniors who live in their own homes in California: check your property tax bill for parcel taxes. If you are over 65, you may be eligible for an exemption from such taxes, but you have to file a form with the taxing authority that levied the charge. The parcel taxes are typically levied by school districts (with voter approval). In some districts, there may be no senior exemption or it may be available only to low income homeowners. In my area, such taxes total almost $1,000 annually. Your property tax bill may or may not note the possible senior exemption, or the type may be so small that you overlook it. At least from my little bubble the primary painful inflation points are homes and probably medical for many. When I look at prices on goods like, food, gas, clothing and other items the inflation is hard to pin down because its up on some items and down on others. All of the most out of control spending helping to fuel inflation seems to tie back into out of control debt. This country needs to seriously rethink or do some kind of reset on lending. This country’s elites (those who control lawyers, guns, corporation, money printing) will ensure the last drop of saving gets “rent squeezed” out of the working mass. Then we are taking about changes. If you still have some form of savings, and if you are debt free, then you know we are NOT there yet. Until then, they will keep lending, keep dropping lending standards, keep bailing our, keep spending. Just as with the late-stage Roman Empire: the exactions of the state were so onerous on the average ‘freeman’ that it paid to quit independent work and become a slave on a big estate….. The SD local news did a feature on that last night, it concluded that a 2br apartment? would require a person of minimum wage to work three jobs. Are statistical magic performances, employing extrapolation. Plain old common sense and ‘gut’ feelings, will tell you more of what the true state of the economy is. The governmental ‘fairy tales’ that are told and retold ad infinitum, are meant to calm the masses and to keep them in the dark, dumb, fat and happy. 2. People are still getting fed. That means everything’s awesome!!! In fact it’s the bestest time ever. Think about 100 years ago when having no job means it’s coffin time. For a preview of coming attractions once the Fed prints away all government and corporate debts, read Adam Fergusson’s “When Money Dies.” Then grab a wheelbarrow and beat the rush. Except for those with very high incomes, there is no saving going on with most Americans. Inflation and loss of purchasing power and no salary growth as well as high debt levels have killed that. Most people have by now resigned to die penniless; even those with some assets, because most realize that medical inflation will take whatever they have remaining in their process of aging and dying. So true that inflation is currency depreciation, not some mysterious conspiracy of unconnected goods and services to get more expensive. G.19 should make for some good reading next month https://www.federalreserve.gov/releases/g19/current/ if people are buying more and not making more there is only one place to get it. hence, they are also deflating sales of items purchased at retail with price increases for services such as rent, doctor’s visits, and college tuition.. Thanks to inflation, the purchasing power of my salary when I retired in 2014 was about the same as 35 years before in the late ’70s. Inflation is nothing new, it’s been going on for at least 100 years, and what it really is is simply an insidious, evil form of tax.